the price of gold is supply and demand. Gold has been a much sought after commodity since civilized man first discovered it. Its unique properties of scarcity, beauty, and a store of value have made it the most enduring of all financial and/or industrial commodities. In one way or another, it affects all of modern man. The most important financial function of gold is as a store of value. When paper money was introduced as a way to make every day transactions easier, gold for paper was a one-to-one trade, easily converted either way. The paper was basically a receipt for gold on deposit, and the amount of currency in circulation was directly linked to the amount of gold held. Eventually a fractional reserve system was developed which allowed banks to issue more paper money than they held in gold reserves. This let the economy grow and expand at a rate that would be impossible if all paper was required to have 100% gold backing. But, it also left the economy vulnerable to inflation. The amount of currency in circulation grew faster than the amount of goods and services that were produced. The purchasing power of gold, however, remained constant. Through the years, the amount of goods and services that, could be purchased with an ounce of gold have remained relatively stable. There are exceptions, of course, such as during 1979 and 1980 when the prices of gold and silver soared and their purchasing power was substantially increased for a short period of time. 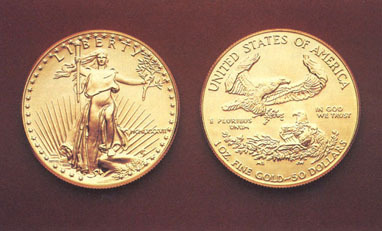 When the U.S. went off the gold standard in the mid 1970’s, the link was broken, and the amount of currency in circulation could be expanded or contracted according to the needs of the economy. This was one of the factors that led to double-digit inflation in the late 1970’s and the resulting high precious metals prices. Some people view gold as an investment, something to “buy low, sell high.” Others take a more conservative view and hold gold as long-term “insurance” against political unrest, inflation, or economic crisis. To this group, selling gold to take cash profits would be like canceling their car insurance and hoping they don’t have an accident. They may increase or decrease their holdings from time to time, but they always have a position. Basically, the only factor influencing the price of gold (or any other commodity) is supply and demand. If there are more buyers than sellers, the price will rise. Generally, the demand-side of the equation will fluctuate more than the supply side and cause the changes in price. Supply wi11 change over time, but will remain fairly constant in the short term. Demand can change dramatically in a short period of time. If a major bank were to collapse, the number of gold buyers would immediately increase. Supply would not be able to keep up in the short term and higher prices would result. Most mines cannot increase production on short notice. The same factors that have influenced the gold market during the past will continue to influence it in the future. The different factors do, however, become more important or less important at different times. For example, during mid-1980’s, traders all waited for the release of Thursday’s M-1 figures to see how much the money supply expanded or contracted. This was thought to be a good short-term indicator of inflation. Most traders totally ignore these figures today. Presently, the monthly U.S. trade deficit (it’s not a trade report anymore, it’s automatically assumed to be a deficit) has some affect on the value of metals, because of its affect on the value of the U.S. dollar against major foreign currencies. In the future, gold should continue to maintain its purchasing power and be a hedge against inflation in times of economic uncertainty. Long-term “gold bugs” will continue to protect themselves and short-term traders will brag about their profits and curse the markets when they lose. How can gold or silver sell at a price below production costs? Number one, it is very expensive to open and close a large mine. Often, it is better to sell at a loss in the short term than to incur opening and closing expenses. Number two, most of the costs involved in operating a mine are fixed costs; they must be paid if the mine produces 100,000 ounces or no ounces. If the mine is producing, even at a loss, a good portion of the fixed costs are probably being met. If the mine is not producing anything, there is no income to meet at least part of the expenses. It is like a landlord with a $1,000 a month mortgage who can only rent the house for $800. He is better off renting it for $800 a month and having a $200 a month loss, than letting it sit empty and get no rent to pay the $1,000 mortgage. But obviously, he cannot do this forever. By producing at a loss, mines can contribute to keeping the price of the metal low. If prices are down, supply is greater than demand. By continuing to produce, mines are adding to an already over abundant supply. Something must change in the demand-side of the equation in order for prices to go back up. It is, of course, easy to see where the small-scale miner can nestle comfortably within the security of this ongoing dilemma. Regardless of the small day-to-day fluctuations in the overall gold price, the small-scale miner, properly equipped, can ideally continue to operate profitably and on a cost-effective basis. And due to the very nature of this scale of operation, this type of gold producer, unlike the major producers who deal in gold futures as much as 1 1/2 years in advance, can quickly react to the market opportunities as they present themselves, either by holding their gold or quickly selling it off, keeping in pace with either short-term rallies or major upswings.